The cemetery lies on a hill on the eastern bank of River Bai, about 10 km northeast of the city of Nanyang, Henan province. The hill stretches from North to South, and is ca. 1.5 km west to the river. The cemetery is located inside a ditch, which is about 500 meters north to the village of Xiaxiangpu (Xindian town, Nanyang city), where the South–North Water Transfer Project carried out. In April, 2012, the cemetery was found raided; so it had to be excavated at once. A month later, on the 28th of May, an archaeological rescue team, organized by the Institute of Cultural Heritage and Archaeology of Nanyang city, excavated the site and found 19 tombs and 1 pit. So far, the number of tombs has been updated to 20, which have produced a large quantity of artifacts made of bronze, clay, jade and lacquer. Area excavated mounts to about 2800 square meter. The team also investigated the area outside the ditch, confirming the existence of more than 30 burial sites. The first stage of the excavation focuses on 20 tombs. They have been arranged in three rows (classified as Southern, Middle, and Northern) inside the ditch. All tombs are earthen shaft tomb, and lies from south to north. Two of them, M1 and M6, are classified as large-sized tombs, with length over 5m and width over 4m; both contain wooden coffins that are relatively intact. Outer coffins are protected by a 0.8-to-1.0-meter-thick layer of “qinggaoni” (bluish white clay, always used to protect the coffin from moisture and decadence), outside which there is a second-tier platform. The tomb is about 8 meters deep. Eight tombs are classified as medium-sized (with both length and width around 4 m); they are M2, M3, M4, M5, M7, M16, M19, and M20. They also contain wooden coffins protected by “qinggaoni” and surrounded by the second-tier platform. Ten small-sized tombs (with both length and width below 2m) are lined up from east to west, on the north of M1 and north dam of the ditch. The southern part has been damaged; so it is not certain if there exists any coffin. There are no burial goods either, except perhaps one pottery. Burial M1 is earthen shaft tomb, which contains large wooden coffins. There’s a great quantity of “qinggaoni” around the outer coffin, which is about 1.0 meter thick. The tomb lies from south to north, with an area of 6.4 m * 5.3m. This eight-meter-deep tomb has been so brutally raided that only a handful of bronze and jade wares have survived. The team has found nine pieces of ding tripods, among which one has a large handle and two small feet, 7 of them belong to one set with similar form, similar decoration and different size. Inscriptions of “Marquises of Er State” were found in those of six ding tripods, as well as in 2 bronze lids of gui containers.3 bronze li tripods with the same form and decoration were also inscribed with “Marquises of Er State” in the rim. Two lids from some bronze square hu (wine container) have been unearthed too; both are identical in size, structure, and décor, with “yangbo” inscribed on them. Other discoveries include a yi-pan set (including one yi container and one plate, with inscription in yi fragment), two bronze tripods, two fu (food container, always used in ritual ceremonies), and a number of chariot and harness components. Among the jade objects, there are several bi disk, ge dagger, huang pendant, jue ring, and jade tiger. Burial M5 and M6 are laid side by side, with the latter lying to the east of its neighbor. The two are about 1.5 m apart; probably belong to a couple in different chambers of one multiple-burials tomb. M6 are shaft tomb with a wooden chamber. The tomb measures about 6 meters from south to north, and over 5 meters from east to west. About 8.5 meter in depth, it is surrounded by and based on a 0.8-meter-thick layer of “qinggaoni”. AlthoughM6 has been looted long before, it nevertheless has produced several burial goods such as artifacts made of bronze, jade, lacquer, and wooden. Among the bronze wares there liesone “ding” tripod, one zun vessel, one fangyi wine vessel, one gui container’s lid, a lid for an incense burner, one piece of zhi goblet, and an object in the shape of a crane head. A set of bianzhong (a chime of bells) of six pieces, inscribed with “marquis of Er state”, is also unearthed. 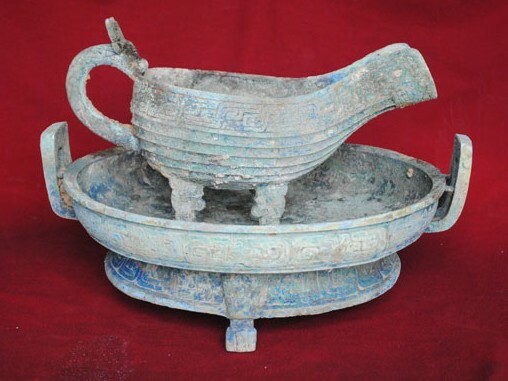 Other artifacts include a set of bronze zhong bell with 5 pieces and a set of bronze bell with 9 pieces, as well as some chariot and harness components. Jade artifacts are various in types, including ge dagger, jue ring, bead, and xi tusk-like ornament. Two wooden puppets have also survived, along with some lacquered fu container and dou vessel. The most valuable among these discoveries are three bronze ge daggers with wooden handle, and two bronze tube-shaped utensils (connecting the horsewhip and its wooden handle) with wooden handle. M5 is similar to M6 in terms of structure (i.e. earthen shaft tomb), only in a medium size with a wooden coffin and an outer coffin. The grave goods are consisted of two bronze ding tripods, two li tripods, two fu containers, two gui containers, one plates, and one he vessel. Among them, both ding tripods and fu containers are inscribed with “Er Jiang”. Jade artifacts are not lacking either: several ge daggers, huang pendants, and pierced beads ornaments have been unearthed. West to M5, burial M19 and M20 lay side by side, with a 2-meter distance between them. Both are earthen shaft tombs containing a coffin and an outer coffin; they are supposed to belong to a couple in different chambers of one multiple-burials tomb as well. M19 has produced bronze ding tripods, gui containers, yi water containers, hu pots, bells, chariot bells, and other chariot and harness components, among which gui container and yi container are inscribed with characters of “Marquis of Er state”. Jade beads are also uncovered. Burial M20 contains several bronze wares, including ding tripods, gui containers, plates, and one fu container and one he vessel, and jade artifacts such as huang pendants, ge daggers, beads, strip-shaped ornament, fish and bead. Fu container from M20 is inscribed with “Er Jiang”. Burial M16 and M7 are earthen shaft tombs, containing one coffin and one outer coffin, with a second-tier platform, and occupied by a couple in different chambers of one multiple-burials tomb. 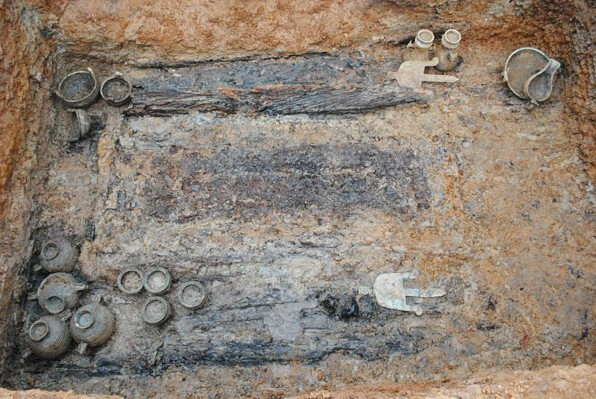 From M16 unearthed bronze ding tripods, gui containers, li tripods, hu pots, and yi water containers with inscriptions; four bronze sha coffin-ornaments (fan-shaped decoration, always placed on both sides of the coffin) stand close to the western side of the coffin. Jade flake ornaments and beads are also among them. M7 has been visited by grave looters even in the past. Nevertheless, it is still in possession of bronze wares—including spears, adz-heads, arrowheads, fish-shaped ornaments, buckles, chariot’s axle endpieces and axle-pin , as well as jade artifacts such as ge dagger, jue ring , and butterfly-shaped pendant et. al. Academically, the discovery and excavation at Xiaxiangpu cemetery are extremely significant, especially in that it changes the conventional views towards Er state and its history. Bronze wares from burials M1, M5, M6, M16, M19, and M20 are inscribed with characters of “Marquis of Er State” as well as “Marquises of Er State”. Judging from burial’s size, structure, and arrangement, M1 belongs to the marquises of Er state, while M5 and M6 belong to a couple buried in different chambers of one multiple burials tomb; the same can be said for M7&M16, and M19&M20. Therefore, there are at least four generations of the marquis of Er state buried at Xiaxiangpu cemetery. Those tombs indeed provide precious material resource to the understanding of Er state’s location, history, and its relationship with other neighbor states such as Yang and Jun state.